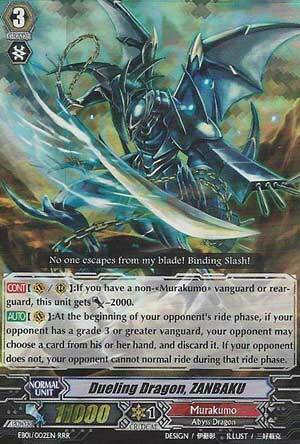 [CONT](VC/RC):If you have a non-«Murakumo» vanguard or rear-guard, this unit gets [Power]-2000. [AUTO](VC):At the beginning of your opponent’s ride phase, if your opponent has a grade 3 or greater vanguard, your opponent may choose a card from his or her hand, and discard it. If your opponent does not, your opponent cannot normal ride during that ride phase. …ew. He LITERALLY did nothing at all. Not even in Crossride meta.